I have a fun new find to share with you today. Those of you who live in Utah are probably familiar with Lehi Roller Mills. 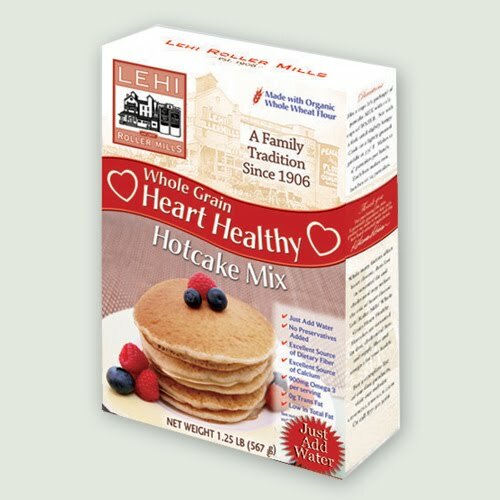 But if you live outside Utah...Lehi Roller Mills is a local Utah company that sells pre-packaged seasonal and specialty retail bread, muffin, pancake, brownie and cookie mixes. They've been around Utah since the early 1900's when they started as a flour company. One of their many claims to fame would be their appearance in the awesome 80's flick, Footloose! The famous Kevin Bacon dance scene takes place at their mill. Anyway...besides the fun movie trivia, I wanted to tell you about a new product they've recently put on the market. I'm only sharing this with you because I really do like it and highly recommend it. I would never suggest anything that I don't stand behind 100%. I'm always hesitant purchasing or trying something prepackaged and "healthy". But with a little research I've discovered that this stuff is all it claims to be. Each serving is loaded with 8 grams of protein, 5 grams of fiber, it's 100% whole grain, and only has 3 grams of fat. More importantly they really do taste good. My little r loves these pancakes. She gobbles them up like crazy! 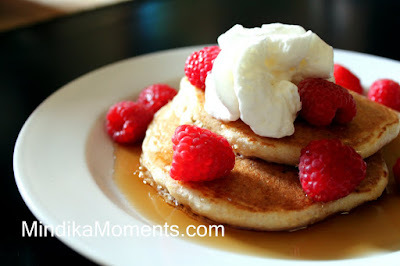 Even my picky husband who's first words before tasting one was, "whole grain healthy pancakes?? I'm not expecting much." Well...he loved them! Obviously I love them, or I wouldn't be sharing them with you. Seriously, just look at the picture. If you're going to cover something with syrup and whipped cream..ironic I know... it might as well be healthy...right? Don't lie, I know your mouth is watering! So next time you're in the grocery store, I recommend picking up a box. If you can't find them where you live, you can purchase them online HERE! We really like this one too! oh yum! Now I'm hungry. :) Costco had these a while back and they are tasty pancakes. I'll have to get our family some more. Can I just say thank you for helping me plan my dinner menu for the next few weeks! You are my inspiration. I absolutely HATE coming up with dinner ideas. It's so nice of you to do it for me:) I can't wait to try some of this stuff!